Exhibiting the Sky Yurt at the Champlain Makers Faire was a wonderful experience. We were set up right next to the entrance to the Carriage Barn where all the indoor exhibits were housed. People stopped to read our text display, played with some of the models, and prowled around the Sky Yurt. Kids laid on the the grass and looked up at the sky through the ribs and cross stays. Lots of head scratching, Questions kept emerging. Then as some folks began to understand the design challenges, they began to share ideas. Some conceptual, some very concrete and practical. All thought provoking and useful. The three broken ribs on the structure was really a set back for the team. I was able to replace one and then repair and sister the other two. I got an outer top cover finished, but didn’t have time to test it and the tie down system. So I just went with the framework. My engineer/artist buddy Andy Wekin and his crew Otis and Ezra worked with me to get the legs installed and reinforced. I replaced some broken connectors, made an exhibit poster, and we were ready to roll. 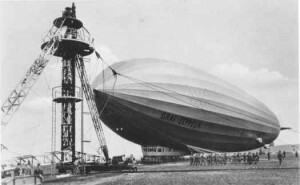 It was a scramble to get the structure set up. We got a good start on Friday afternoon and evening. Darla – my main squeeze – pitched in on Saturday morning and just as the first of the crowd trickled in, we were up. Where to take this project next? I learned a lot from the ideas that visitors shared with me. I’ll post some of them in due time. But the big learnings for me are guiding to the next steps for the project.Time to go back to the drawing board and get a designer/engineer involved who knows tensile/tent structures and can do the math. The yurt structure could be so much lighter and much better engineered. My build/design process can only take me so far. Using off the shelf items, and build/designing as I go, has real limitations. I need to have someone on the team who can look at the whole system and come up with design parameters for the components. For instance, maybe properly sized tubing for the ribs and cross connectors with aluminum hubs. The whole frame structure could be lightweight and go up quickly. So I am putting the building to bed for the winter. When I start next summer, I hope to have a much improved and well thought out design to build from. 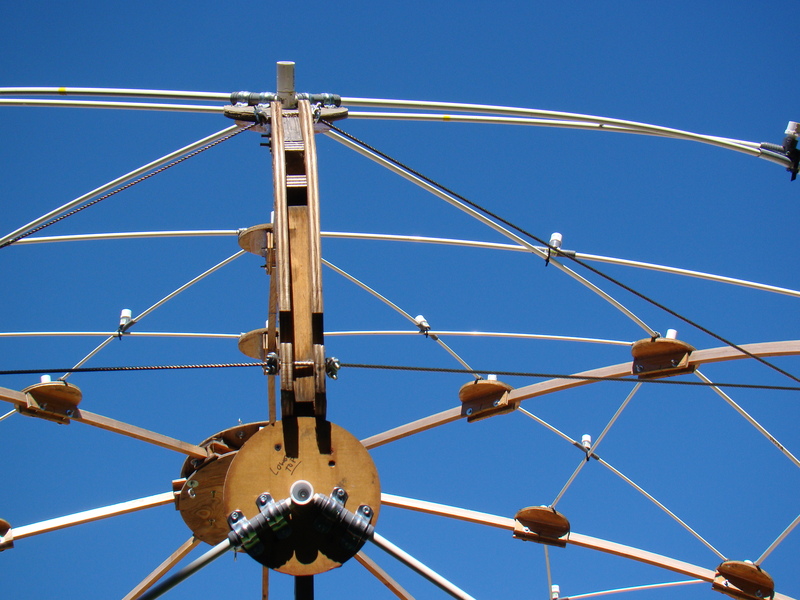 This entry was posted in Building, Design, Sky Yurt, Uncategorized and tagged Andy Wekin, Makers Faire on November 30, 2013 by macinessex. Damn. What was I thinking. I was planning to put the cover on today. Finally got it finished. But the wind was blowing too hard, so I moved on to some mechanical stuff. Building some braces for the frame. Deciding on some modifications for the lower cover panels. 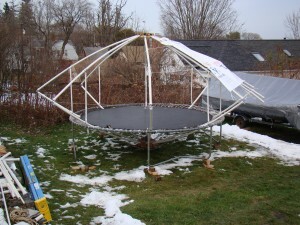 I have been thinking a lot about how I was going to get the telescoping legs inserted into the trampoline frame.Once the legs are in, the structure can be jacked up incrementally, raised to a 10 foot height and leveled, one leg at a time. 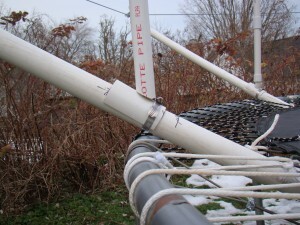 The telescoping legs are about 6 feet high in the down position. So my plan was to dismantle the Sky Yurt structure, including the floor, put the legs in. 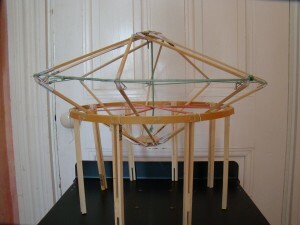 Build the Sky Yurt back, and then incrementally raise the structure on its legs. Sensible, safe, practical. But then today I thought, what the hell, I’ll give it a shot. Maybe I can get those legs inserted without having to take the Sky Yurt down. Of course, I was planning to have some help. At least another pair of hands But maybe I just might be able to do it myself. Got one leg jacked up OK. But it got pretty wobbly. Should have just put it down again, until I had some help. 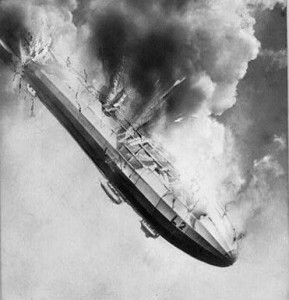 But as I left the jack and began to shore up one of the other legs, the whole structure cam down with a crash. One corner dropped 3-4 feet. It looked OK, but on further examination, I realized I had cracked three of the lower laminated cedar beams, one clean through. I don’t like to call myself stupid, but I was sure exercising poor judgement. One thing I am good at is disaster control (I think you might be able to guess why). Got busy and took all of the hubs and connecting rods off the upper beams, to take weight off the lower beams. I’ll break the whole structure down. I plan to repair the cracked beams with epoxy and fiberglass tape. I still hope to exhibit at the Makers Faire, but probably without the cover or the outer skirt. But I do plan to have the frame 10 feet up in the air. This entry was posted in Building, Sky Yurt, Uncategorized on September 9, 2013 by macinessex. Yes! Just got the word that the Sky Yurt will be an exhibit at the Makers Faire at Shelburne Farms in Vermont September 28 and 29. 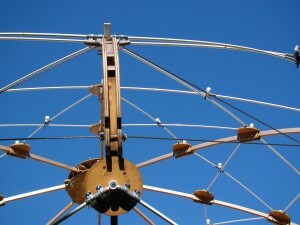 Details at http://www.champlainmakerfaire.com/. 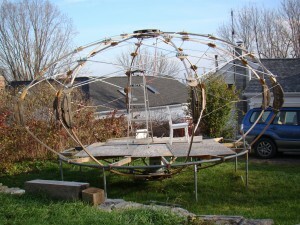 I understand that there is lots of discussion in my little community of Essex as to “What is that space ship thing in the backyard?” I am working hard to get the prototype completed in time for set up on the Friday before the Faire. At first glance it doesn’t look like much has changed. But I am booming ahead in two important areas – getting the Yurt cover designed, laid out, cut and taped together. And building and painting the telescoping legs that will progressively lift the tramp frame to approx.10 feet off the ground. 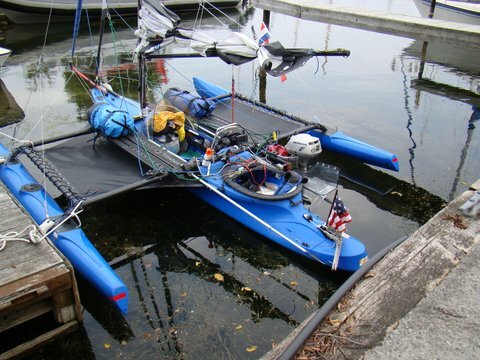 I am taking a page from the book of the folks who are using polytarp for sails to for small home-made boats. The word is that the sails out of this stuff will last for at least a couple of seasons. I am using Tyvek house wrap to make the roof and the side panels for the Sky Yurt. Why Tyvek? It is relatively easy to work with – it cuts with a scissors, can be marked on with a felt tip pen and the panels can be fastened with double-sided, fiberglass reinforced, indoor-outdoor carpet tape. I won’t be the final fabric that I chose for the cover, but it will work as I am experimenting with with the best way to shape and secure the panels. Oh, I am so challenged making and fitting the test panels – which I will use for patterns for the other panels. I am rather dyslexic, always have had trouble with spelling and jig saw puzzles and scrabble and linear sequencing. 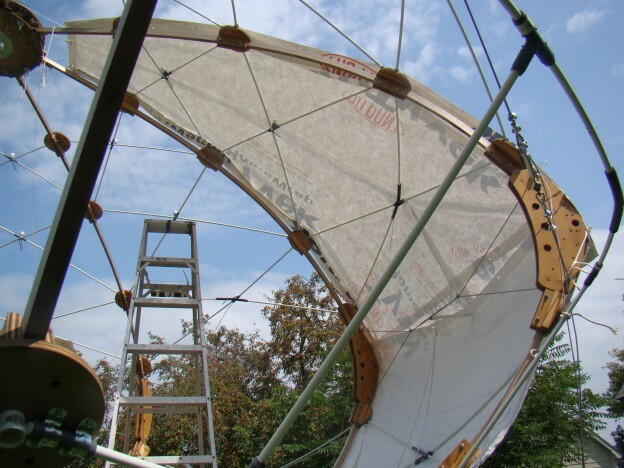 And while the Tyvek is flat, the Sky Yurt roof and sides are curved. Yikes, I’ve been up and down the ladder too many times with my test panels, marking, measuring, cutting, taping,. Doing lots of head scratching. But I think I got it now. One more modification and then I can begin turning out panels and taping them together. Yahoo! This entry was posted in Building, Design, Sky Yurt, Uncategorized and tagged Tyvek on August 28, 2013 by macinessex. 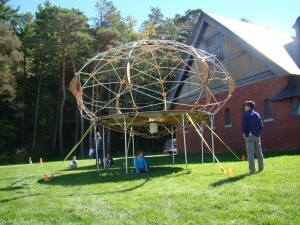 Sky Yurt as an exhibit at the Makers Faire in Vermont? The Sky Yurt is the first prototype in a series of designs that provide working/ living structures for a nomadic community of artists/crafters/makers. 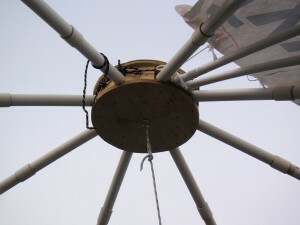 The eight –sided Sky Yurt ‘s floor is 14 feet in diameter, with roof extending to almost 20 feet in diameter. The floor is perched 10 feet above the lower tent-canopied workspace which is an integral unit 32 feet in diameter and separate from the upper living space of the Sky Yurt. 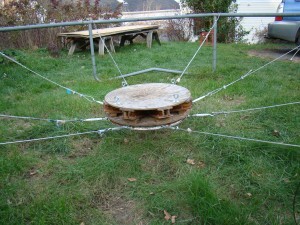 This lower space acts as the mother ship, and the upper living space structure actually “docks” to the trampoline frame at the center of the mother ship. 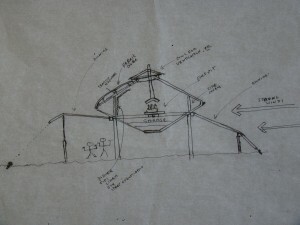 The prototype is a full scale working model which is allowing experimentation with design challenges inherent in two separate tent structures, the work structure on the ground and the yurt structure elevated 10 feet of the ground, combined with the need to make the combined structure portable. Structural materials, except for the laminated cedar beams, are readily available and easy to modify, including the trampoline frame, plywood, lumber, building wrap, epoxy, PVC pipe fittings, and fiberglass fence posts. The design is “open sourced” and as the structure is modified and the engineering needs are better understood, future prototypes will utilize lightweight “engineered” materials and design features that improve portability. I worked out a deal with my neighbors Bev and Brian to set up the Sky yurt in their big backyard in exchange for doing their lawn. I just have one more set of cross struts to add to the lower structure, and then I can begin building the fabric covers for the tent structures. I will also start to deploy my anchoring system. I am moving into new territory with this prototype. 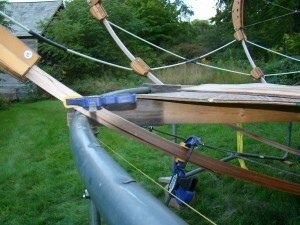 I see the Faire as an opportunity to engage makers, elicit design ideas and move the open sourcing of the project ahead. 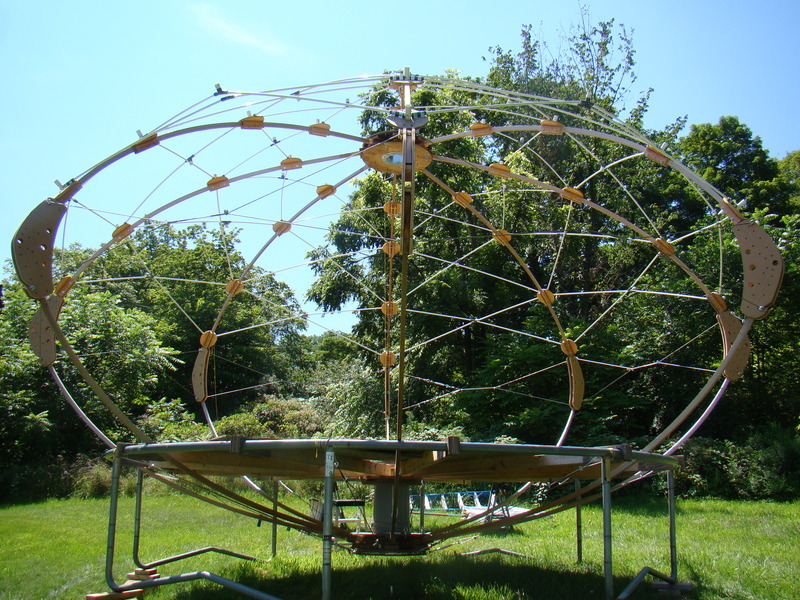 This entry was posted in Building, Design, Sky Yurt, Uncategorized and tagged Makers Faire on August 1, 2013 by macinessex. I started making very rough sketches years ago. I wanted an open, circular, covered workspace on ground-level. The living space needed to be elevated, so you could almost walk underneath it, or at least see through it. I flattened out the tall tipi shape to make it more like a diamond, like in my early dowel and wire model. I decided the yurt would set on vertical uprights, doubled under each set of beams. The workspace tent structure would then radiate out from the eight-sided elevated yurt-like living space. The fabric cover on the workspace would need to be adjustable, so one side could be tucked down to block the wind, while the opposite side might want to be open wide and high to let in the warm early morning sun.. I made a painstaking model out of dimensional balsa wood -held together with pins and light wire. That got lost in the shuffle over the years. 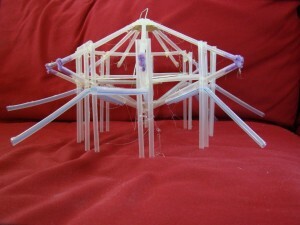 The next model used clear straws for beams and joists, pipe cleaners at the outer ends of the beams, and cardboard and hot glue for the center hubs. I really liked the look of the design but some real concerns began to emerge. I was still stuck on using vertical posts to hold the yurt off the ground. The whole structure was looking less like a tension structure. Those posts were going to need to be heavy and I was thinking that the whole structure was going to need to be pretty beefy to match it. And hell, this needed to be nomadic – meaning light and strong. You need to know as I walk you through this process, if you haven’t figured it out already, that my skills as a designer are severely limited. I can’t draw worth a hill of beans. I am dyslexic and have trouble with sequencing. I can get an idea, walk around thinking about it almost all the time – but I have to build the damn thing so I can begin to figure out if my “design” idea will really work. My neighbor Bruce, who has watch my “follies” emerge in the backyard laughed the other day, “I have heard of design/build, but I think what you do is build/design”. And he hit the nail on the head. That my process – build/design. It ain’t pretty, won’t work for a brick and mortar house, but with my Sky Yurt, I can take it apart, fix what doesn’t work and give it another shot. This entry was posted in Building, Design, Sky Yurt, Uncategorized and tagged models, tensegrity, workspace on January 28, 2013 by macinessex.